I've been running the Giant Race San Jose since the inaugural in 2012. 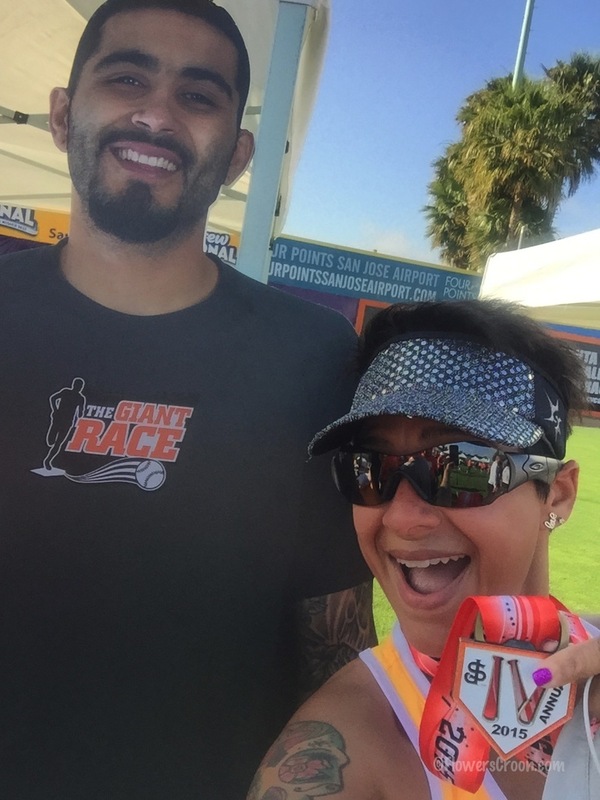 I love this race because the crowd is awesome, the distance choices are perfect for beginners or regular runners, and like baseball itself, it's a fun family event. My race kit included a Nike Dry-Fit top in orange, a Champion C9 black running skort, my Saucony Triumph shoes and my black CEP socks. This year my race schedule has been cut back significantly in order to align with my daughter's senior year of high school / freshman year of college. That's a good thing because my allergies are increasingly affecting my everyday life to the point where I am now also dealing with asthma. I've been coughing and barely getting any sleep for over a month, and running hasn't been as enjoyable as it used to be. That wasn't going to stop me from running this race though. Race morning I was excited to see my friend Laura at the start line! We run a lot of the same local races and it's always awesome to see her smiling face first thing in the morning. The race started at 7:30am sharp, and I was running the 5K distance. 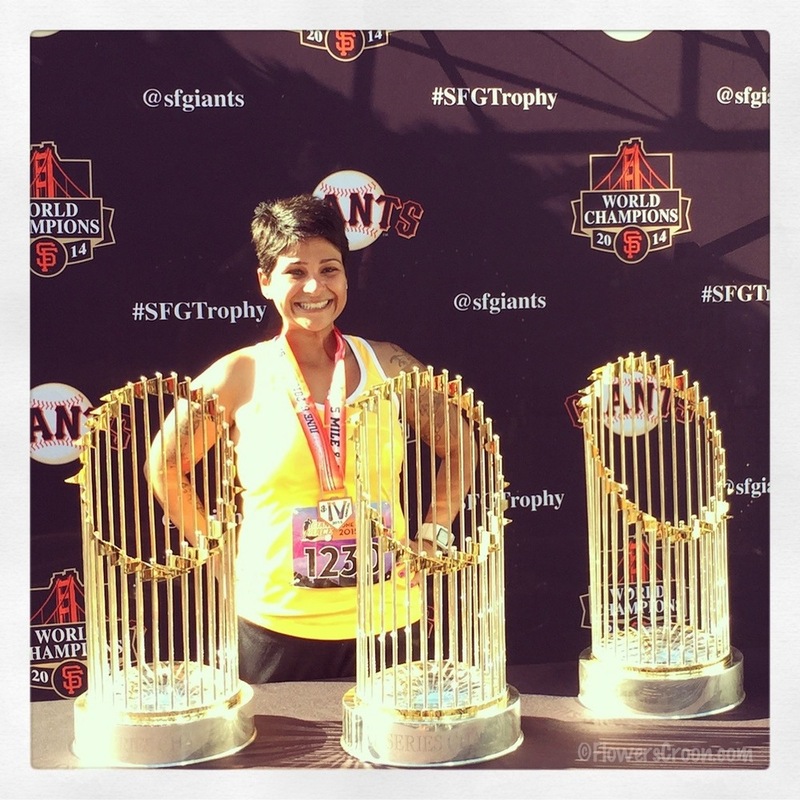 My goal was to finish quickly in order to take a photo with the World Series trophies and make it home in time to get ready for an early afternoon birthday party. I ran using a 1:30 run / :30 walk interval. My goal was not to PR, and I had no intention of doing so. I coughed and coughed the entire time, hacking my way to the finish line, faster than I expected. The course was the same as it's always been - fun and easy! When I finished I realized I did PR and was pretty surprised. It wasn't a huge PR - a little more than 30+ seconds over last year - but it was still a PR! I had time to take a few photos and was finally able to get a glance at the San Francisco Giants World Series Trophies & have my photos taken with them. What I learned from this race was that even though I am struggling with asthma and allergies - muscle memory, speed training & weight lifting have benefited me. I am now more inspired than ever to overcome these obstacles and keep pushing. I can't wait for the next race!